The Palm Springs room features a vintage sign of a bathing beauty on the mantel at the Dwell Hotel. Seija Ojanpera has a Finnish name, a resume that includes teaching English to the children of Italian royalty and the distinction of opening downtown Chattanooga's most unique new place to stay, The Dwell Hotel. The 33-year-old Chattanooga transplant (whose name is pronounced Say-yah Oy-yen-bettah) has remodeled the former Stone Fort Inn at 120 E. 10th St. and its Terra Mae restaurant. 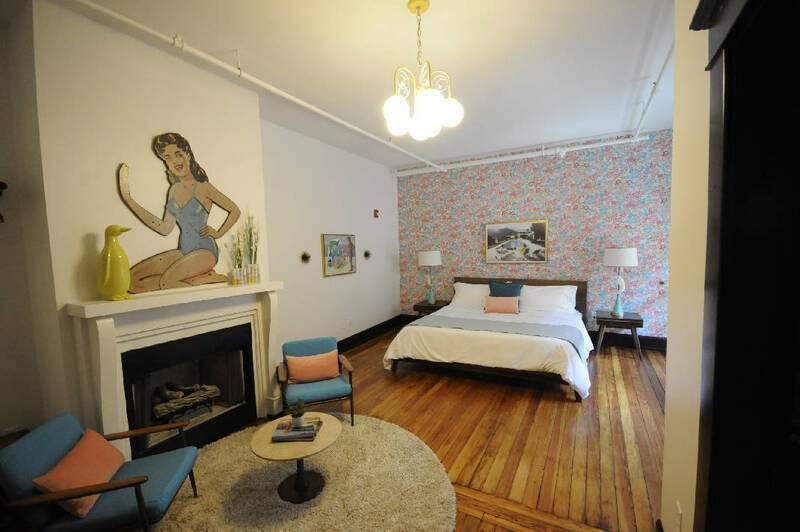 Her boutique hotel has furnishings from the 1950s, '60s and '70s, including Naugahyde couches, a tiki bar and even a coin-operated Japanese massage chair that Ojanpera found shopping through such sources as Ebay, Etsy and thrift stores. Each room was completely redone and has its own name and theme. The Bee and Argyle rooms have wallpaper to match, for example, while the Palm Springs Room has photos of the Southern California desert resort town. "I wanted it to be a lot of fun," Ojanpera said. "Almost an art piece; a little gallery in each room." She credits her friend Laurel Creager for helping with the interior decorating. "I wouldn't have made this bold of a statement without her," Ojanpera said. The Dwell Hotel also has brand-new luxury furnishings, including mattresses made locally by MurMaid, an updated heating and cooling system and bathrooms completely redone with new tile, soaking tubs and "rain" showers. Ojanpera kept the hotel's Terra Mae restaurant, but enlarged its kitchen, refinished the wood flooring and redid the seating. And the restaurant is no longer subtitled as an "Appalachian Bistro." Chef Hardin Cowan, who stayed on as the business switched hands, will offer more of the Asian- and Moroccan-themed cuisine that he specializes in. "It's not Appalachian," Ojanpera said. "We're not pigeon-holing it to any one kind of cooking." The Dwell Hotel also has a new bar, Matilda Midnight, just inside the front door that's open daily from 10 a.m. until midnight to serve tapas, beer, wine and cocktails. "I wanted it to be a nice, cozy bar that was always open for hotel guests," Ojanpera said. The bar's furniture is mid-century modern with seating for about 35 that ranges from wooden chairs shaped like giant hands to knee-high stools. "These little stools are actually from a McDonald's in the '50s," Ojanpera said. The drinks menu has a handful of house cocktails with tarot-card names and exotic ingredients including smoked paprika rye, cardamom bitters and oleo saccharum — citrus-oil sugar that dates back to Roman times — concocted by Justin Stamper, the hotel's food and beverage director who was a 2014 finalist in the Most Imaginative Bartender contest held in Nashville. Ojanpera envisions the bar a place where a couple could stop during a night out on the town. There are no TVs on the walls of Midnight Matilda, which sets it apart from the vast majority of Chattanooga bars. And Ojanpera doesn't plan to change that. "Somebody's already asked if we would show some games, and I said, 'no.'" The restaurant and bar have been open since April 14. The Dwell Hotel has been open since May 12. Rooms cost between $225 and $325 a night, and all 16 rooms have been full on the first two weekends, Ojanpera said. She expects the occupancy to stay high. The brick-and-stone building has held a hotel since it was first built more than 100 years ago, and The Stone Fort Inn was a good business, Ojanpera said, with a 75 percent occupancy rate in 2014 and a 68 percent occupancy in 2015. "They actually were doing really well," she said. Even when Ojanpera was a little girl, she had dreams of running a hotel. She diagrams of them — including one of a three-story hotel in the middle of a city very much like the one she now owns. "I drew almost this exact thing when I was 10 years old," Ojanpera said. Ojanpera said she traveled extensively to look at other hotels to get ideas for The Dwell Hotel, and filled binders with things she liked and disliked about the places she visited. One of her favorites is the Beverly Hills Hotel, and she pays it homage with its signature palm leaf wallpaper in a Dwell Hotel "parlor" to the right of the front desk. Buenos Aires inspired Ojanpera to put "living walls" of plants in Terra Mae's 73-seat dining room, since they're popular in the Argentine capital. Prior to moving to Chattanooga six years ago, Ojanpera spent three years in Italy, including a stint working as an English teacher and personal assistant for the Bourbone, a royal family that once ruled in Italy. She also taught English to children for the Avogadro family, whose ancestor contributed Avogadro's number to chemistry. Ojanpera, whose dad was born in Finland, moved around as a child from West Palm Beach, Fla., to Cortez, Colo. to Mobile, Ala., where she attended high school. She went to the University of Alabama in Birmingham, where she met Gary Allan Davis Jr. when they both waited tables at a Bahama Breeze chain restaurant in Birmingham. "He actually was my trainer," Ojanpera said. "He was like the star waiter." Davis went on to make millions as one of the trio of entrepreneurs who founded Access America, a transportation and logistics company. It was one of Chattanooga's most successful startups with sales estimated at $600 million when it was sold in April 2014 to Coyote Logistics for a reported $125 million. He's now a partner with the Lamp Post Group, a downtown Chattanooga "incubator" of startup businesses launched by Coyote Logistics's three founders. They bought The Dwell Hotel building late last year for $1.85 million. Ojanpera declined to say how much they spent renovating it. Ojanpera and Davis are business partners in The Dwell Hotel. Ojanpera said she owns 51 percent and he owns 49 percent. "He's been my best friend for many years," Ojanpera said of Davis.